As new WCPM Stones are added to gardens around the world, it will, in time, become the largest monument dedicated to Global Peace. The sculpture serves as a milestone for the 'Theory of Iceality on Environmental Arts' Movement indigenous to the Great Cleveland Area, that is to "Assist in understanding of the relationship between Humans and their Environment through the Arts ultimately promoting a sustainable global Culture of Peace for all Living Things". The WCPM was officially inaugurated in 2005 at the 3rd World Peace Conference held in Verbania, Italy by American Cultural Ambassadors David and Renate Jakupca where they received an Italian Medal of Arts. They were also recognized by the United Nations in Geneva, Switzerland and in 2006 appointed Universal Peace Ambassadors. The WCPM is organized in support of the UN Decade of Peace and Non-Violence for the Children of the World and the UN Millennium Development Goals. Thanks for joining this peace movement. It will take all of us working together to bring a global sustainable Culture of Peace to every child and we wanted to make sure you know about all the opportunities to get involved in your community and online. Check out the resources at www.wcpm.info -- learn how you can connect with fellow supporters, organize in your neighborhood, build our local, national and international grassroots organization, and stay informed with the very latest Peace news. "Assisting in understanding of the relationship between Humans and their Environment through the Arts ultimately promoting a sustainable global Culture of Peace"
Check out the resources below -- learn how you can connect with fellow supporters, organize in your neighborhood, build our local, national and international grassroots organization, and stay informed with the very latest Peace news. Here you can promote your Peace Stone and share with others and what children are doing around the World: add music, video's, ideas, and communicate with other children worldwide. How can I have a Peace Stone in My City? The Worlds Children Peace Monument is the largest art work dedicated to a sustainable culture of peace. It is the keystone of the coast-to-coast GREAT AMERICAN PEACE TRAIL!! but throughout the whole year !" especially for the Worlds Children Peace Monument. ICEA has announced plans to have Peace Children as delegated representatives of the Worlds Children Peace Monument (WCPM). This will inspire students to develop their own insights into important themes like freedom, leadership and democracy. The WCPM Art can inspire otherwise disengaged students. The WCPM Project was founded to promote leadership and activism in establishing a global culture of peace in among young children. 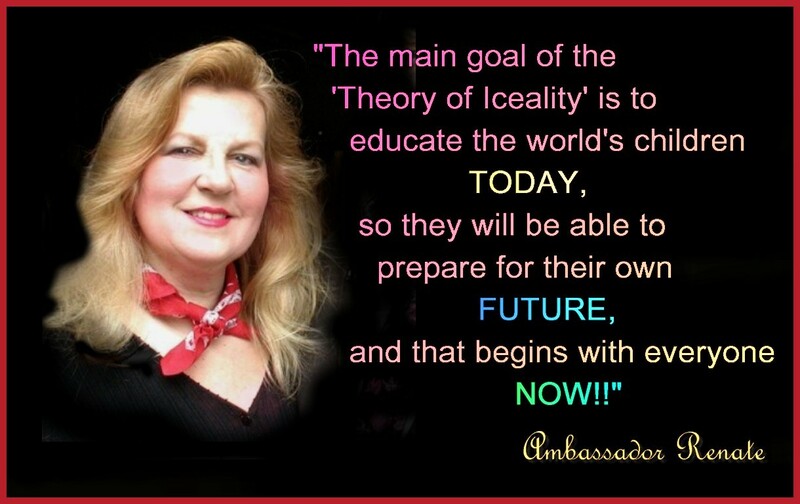 The program is designed to strengthen, empower, and equip the worlds children as agents for change in their world. By increasing the participation of children in social, political, and economic decision-making, WCPM seeks to question and redefine the nature of leadership and to promote perspectives and practices that are cooperative, accountable, ethical, and effective. 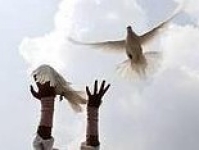 Read the Official 2009 Peace Day Petition ! 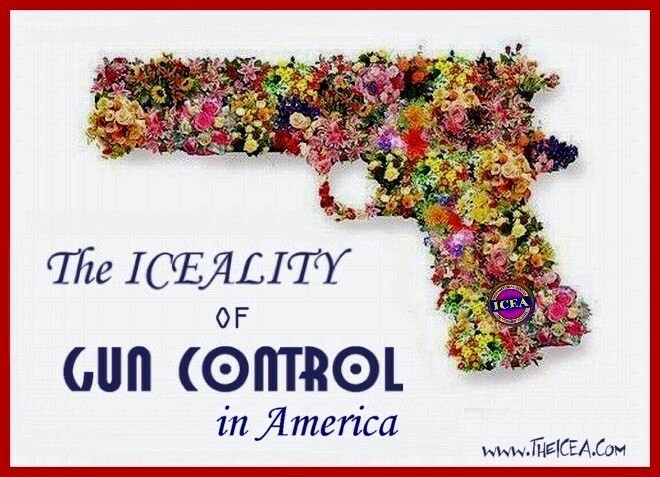 Poets, if you believe in our purposes has an ultimate end; if you agree we can inspire a "Universal Culture of Peace". If you feel a strong commitment as an active member of society, then join us and publish your words to validate your stand for changing the world for the better. Poeta, si conoces los objetivos de nuestro movimiento poetas del mundo, al igual que nuestro “Manifiesto Universal Cultura de Paz” iceality, y quisieras ser fiel a tus compromisos, nosotros te recibimos como uno de nuestros hermanos en tu pasión por cambiar el mundo y que tu palabra, como manifestación suprema de tu arte, sea la llave para cambiar el mundo y la historia. FAIS PARTIE DE NOTRE MOUVEMENT! Frère poète, connaissant les objectifs de notre mouvement poètes du monde ainsi que notre "Manifeste Universel Kultur i Fred" iceality, si tu souhaites demeurer fidèle aux engagements qui doivent être ceux de tout poète, nous t'accueillons comme l'un des nôtres. Puisse alors ta parole, manifestation suprême de ton art, devenir la clé d'un monde nouveau. 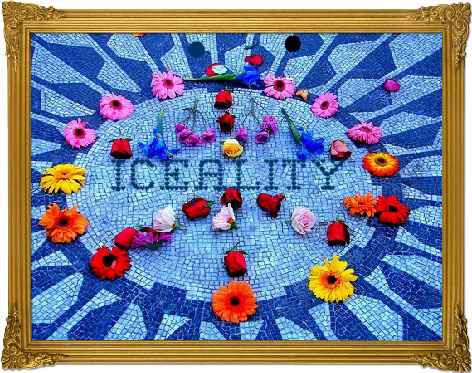 Poeta, se voce conhece o objetivo do nosso movimento poetas do mundo, o mesmo que o nosso “Manifesto Universal Cultura de Paz” iceality e queira ser fiel a seu compromisso, te receberemos como a um irmão com a mesma paixão de mudar o mundo com palabras, como uma manifestação suprema de sua arte e que seja esta a cheve para mudarmos o mundo e a historia.
" Fai parte del nostro movimento! Fratello poeta, conoscendo gli obiettivi del nostro movimento poeti nel mondo e il nostro "Manifesto Universale Cultura di Pace" iceality, se vorrai essere fedele agli impegni che dovrebbero essere comuni a tutti i poeti, ti accogliamo come uno di noi. Possa quindi la tua parola, manifestazione suprema della tua arte, essere la chiave di un mondo nuovo. " DichterIn, wenn Du die Ziele unserer Bewegung poetas del mundo kennst, genauso wie unser “Universal Kultur über Ruhe” iceality , und Du gerne unseren Verpflichtungen treu sein würdest, empfangen wir Dich wie einen unserer Geschwister in Deiner Leidenschaft, die Welt zu verändern und dass Dein Wort, wie eine höchste Manifestation Deiner Kunst der Schlüssel sei, um Die Welt und die Geschichte zu ändern. Olerkilari, munduko poetak geure mugimenduaren helburuak ezagutzen badituzu, baita “Ageri Unibertsala” iceality ere, halaber zure sinesmenekin leiala izan nahi baduzu, guk, mundua alda dadin duzun pasioan, anaiatzat onartzen zaitugu, eta zure berba, zure trebetasunaren adierazpen funtsezkoa izanik, mundua aldatzeko giltza izan dadin. Pesnice, ako znaš ciljeve našeg pokreta pesnici sveta, kao i naš “Univerzalni Manifest Kultura od Pokoj” iceality, i želiš da budeš veran zadatoj reci, primamo te kao jednog od naše brace po strasti da menjamo svet, da tvoja rec, kao vrhovni izraz tvoje umetnosti, bude kljuc za promenu sveta i istorije. Poeta, si coneixes els objectius del nostre moviment poetes del món, igual que el nostre “Manifest Universal Culture de Tranquillité” iceality, i voldries ser fidel als teus compromisos, nosaltres et rebem com a un dels nostres germans, en la teva passió per canviar el món i que la teva paraula, com manifestació suprema del teu art, sigui la clau per canviar el món i la història. Poet, om du känner till syftet med vår rörelse Världens Poeter samt vårt "Universella Manifest Teelt van Vrede" iceality och vill vara trogen dina åtaganden så välkomnar vi dig som en av oss . Med dina ord kan du förändra världen ! یافتی و خواستی به تعهدات خویش وفادار مانی، ما تو را بعنوان یکی از برادران خویش در شور تو برای تغییر دنیا می پذیریم ، باشد که کلام تو که برترین جلوه هنر توست، کلید تغییر دنیا و تاریخ باشد. Ay amedyaz ! mek tessned iwettasen n umussu-nne&#947; Imedyazen n umad’al akw d « walghu-nnegh anmeghrad kültür -in barış » d mek trid ad teqqimed d anmentil izdin, iceality aqel-agh da yissek nessens’uf zund yiwen seg wayetmaten-nnegh g urumsu-nnek g usenfel n umad’al; ad ig wawal-nnek tameskanit tameqwrant n tz’uri-nnek itteggan tasarut n usenfel n umad’al d umezruy. 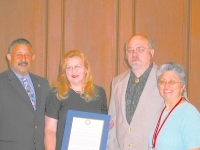 Cleveland City Councilman Joe Santiago honors American Cultural Ambassadors David and Renate Jakupca of the International Center for Environmental Arts (ICEA) on the occasion of celebrating Twenty Years of Community Service by installing the Santa Fe Peace Stone of the Worlds Children Peace Monument at the 2007 World Peace Conference. The purpose of the worldwide movement, 2007 World Peace Conference - "Building a Culture of Peace" in Santa Fe, New Mexico, was to envision solution, use proactive public diplomacy to communicate more effectively with the rest of the world and build understanding for its values and policies and create a program for World Peace Between Nations and Nonviolence in Our Homes and Our Community. With the support of New Mexico Governor Bill Richardson and the leadership of Ms. Louise Diamond, PhD, Jody Williams, the winner of 1997 Nobel Peace Prize, and Arun Gandi, grandson of Mahatma Gandi, and a host of others, made Santa Fe, New Mexico a focal point in America for international hope and peace-inspiring events during the time when wars are raging on almost every continent around the world. 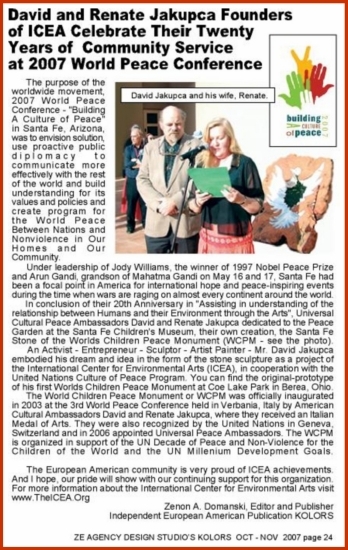 In conclusion of their 20th year of promoting ICEAlity, the understanding of the relationship between Humans and their Environment through the Arts", Universal Cultural Peace Ambassadors David and Renate Jakupca dedicated to the Peace Garden at the Santa Fe Children's Museum, the Santa Fe Stone of the Worlds Children Peace Monument (WCPM). Designed at the ARK in Berea and built at Coe Lake Park in Berea, Ohio, the Worlds Children Peace Monument (WCPM) was officially inaugurated in 2003 at the 3rd World Peace Conference held in Verbania, Italy by American Cultural Ambassadors David and Renate Jakupca, where they received an Italian Medal of Arts. They were also recognized by the United Nations in Geneva, Switzerland and in 2006 appointed Universal Peace Ambassadors. The WCPM is organized in support of the UN Decade of Peace and Non-Violence for the Children of the World and the UN Millennium Development Goals. "The European American community is very proud of ICEA achievements. And I hope, our pride will show with our continuing support for this organization". states Zenon A. Domanski, Editor and Publisher of KOLORS Magazine. At the formation of ICEA, Canadian activist Rick Coronado from Great Lakes United forecasted, " The International Center for Environmental Arts (ICEA) David and Renate Jakupca will act as our benchmark by which we can measure change and continuity in everything from the environment to relations between peoples through the Arts. But more than that, it will remind us that we are not the first People, native and newcomers alike to face difficult choices in troubled times". The winds of change blew as hard then as now. The zoo is in a very vulnerable location. It is located in a low-lying area just a mile from the Gulf of Mexico. After going through three complete hurricane evacuations in less than a year and being closed so long for storm repair, the decision has been made that it would be best to move the Zoo to higher ground. Thanks to an extremely generous donation of 25 acres by Clyde Weir, who is the owner of Souvenir City, and his daughter Andrea Weir Franklin the zoo will be able to relocate to higher ground. This new property is located just off Highway 59 on County Road 6 in Gulf Shores, about two miles north of the Intercoastal Waterway Bridge. The zoo has begun the process of selecting an architect for the project and hopefully will begin actual construction of the new zoo early in 2007.
located in the new childrens part of the zoo. "ICEAlity an understanding of the relationship between Humans and their Environment through the Arts ultimately promoting a sustainable global culture of Peace"